369 MARINA BOULEVARD has been remodeled and designed with utmost attention to modern conveniences and craftsmanship, including beautiful cherry wood floors, fine cabinetry and stone work. The floor plan is especially conducive to entertaining and comfortable City living. 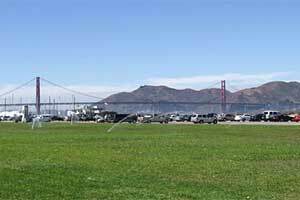 The focus of the house is the view of the Bay & Marina Green and the play of sunlight & sky against the landmark Golden Gate Bridge, Alcatraz Island and the Marin hills. 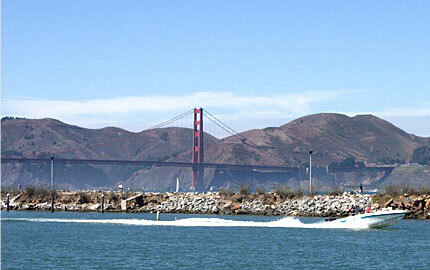 The plying of sailboats & ships, & myriad of sports on the Marina Green add to the liveliness of the urban landscape. The new owner will truly enjoy living on the Marina Green! Arched entry to the LIVING ROOM with views of the bay, Golden Gate Bridge & Alcatraz Island. The well-proportioned room has a marble fireplace set in stunning cabinetry made of imported Mackra wood. Beyond the kitchen is a private BEDROOM with full BATH for house guests or au pair. Wonderful MASTER BEDROOM with expansive north bay views. Built-in entertainment system, his and her closets. Large MASTER BATH with granite and limestone surround, double sinks, 2-person Jacuzzi tub, separate shower and radiant heated floor. Sunny south BEDROOM and spacious BATHROOM with shower over tub, granite and limestone surround. 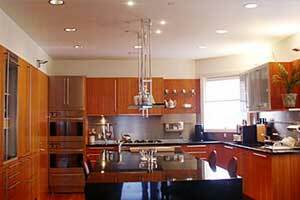 FAMILY/ENTERTAINMENT ROOM enjoys striking views from the Golden Gate Bridge to Alcatraz Island and a large skylight that floods the room with natural light. Impressive floor-to ceiling entertainment system with Bang & Olufsen surround sound system and custom built-in fireplace. 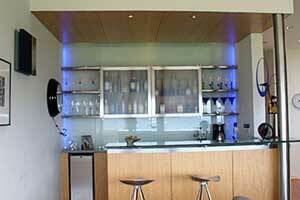 Designer wet BAR with full bar conveniences including refrigerator and ice maker, Miele dishwasher and wine cooler. Sunny BILLIARD ROOM (or fourth BEDROOM) with walk-out sunny south DECK with spa and City views. Full BATH with shower, stone surround and skylight. 3-CAR GARAGE with inside access to the ELEVATOR to all four levels. The Personal Property may be purchased with a separate bill of sale, including the billiard table. Seller’s Property Disclosure Package available on request and should be reviewed prior to submitting an offer to purchase the property. Property Taxes will be reassessed to approximately 1.117% of the sales price.